Langholt means a long oval ridge. 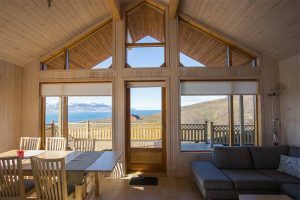 This beautiful lodge is located on the perfect slope overlooking the Atlantic Ocean, surrounding Sulur mountain ranges and is only 45 minutes from Reykjavik. 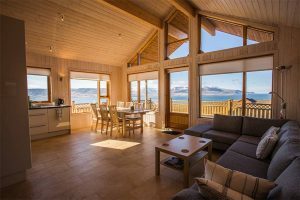 Enjoy the comfort of this warming lodge with large open spaces and a surrounding terrace. 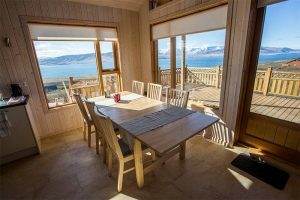 You can enjoy the best views of the area from inside or out. 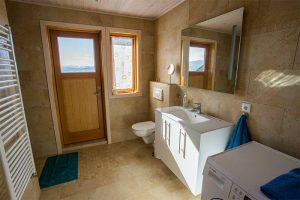 Why not relax in the geothermal tub built in to the steps of the terrace? 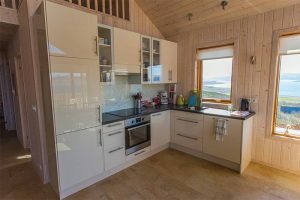 Langholt's location is superb, with a great view on the bay and the Atlantic Ocean. 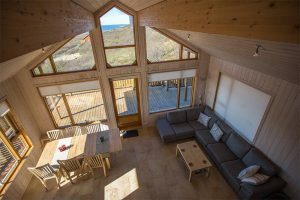 Langholt was built in 2013 and it sleeps up to 5 people. 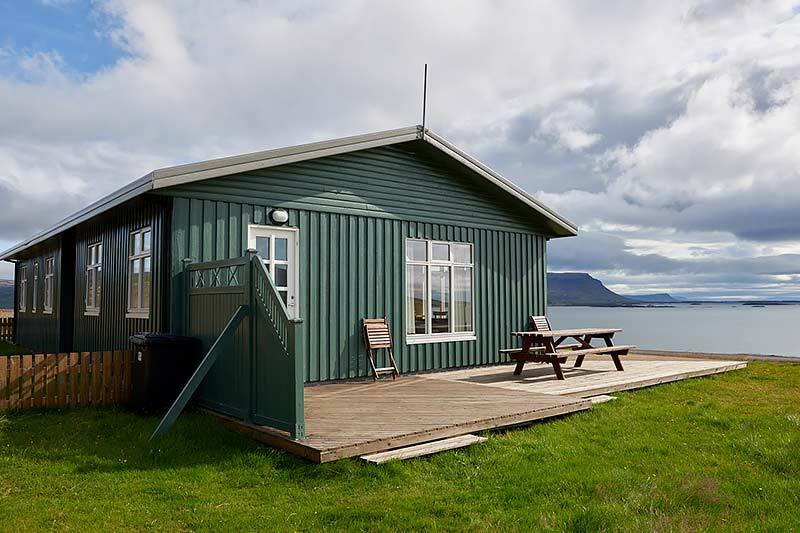 Langholt is perfectly located near some of Iceland's greatest natural wonders, as well as being located within easy access to Reykjavik (45 minutes drive) and Keflavik International airport (1.5 hours drive). 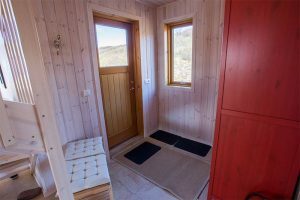 Heading up North or to the Westfjords? 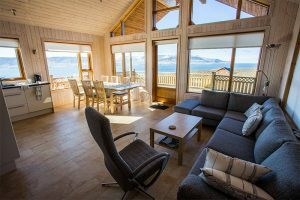 We also run the beautiful "Hamragil" lodge by the town Akureyri up North, "Tvera" lodge at the south coast of the Westfjords. and "Holt" in the Golden Circle. 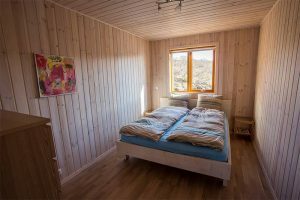 Langholt is only 150 meters away from an identical lodge, Brekka (max 8 pers), which also belongs to the group of Nordic Lodges. Access: Secure Parking, reasonably easy wheelchair access. 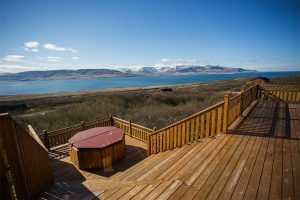 Outdoor: Beautiful terrace, abundant natural surroundings, BBQ & geothermal hot tub. 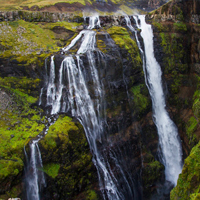 The waterfall Glymur (Meaning "noise-maker" is 198 meters tall and is the highest in Iceland. 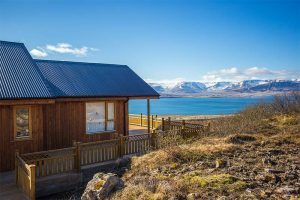 It's located at the end of the bay Hvalfjordur, from Brekka / Langholt Lodge simply drive left and along the Rd 47 for 20 minutes and take a left turn on the trail road when you see the sign, "Glymur". This is a great hike, but needs to be made with a care in the winter time and in slippery conditions. The hike takes about one hour, but the extended hike up along the waterfall and across the river up on the top and back (the best way to see the falls) takes 3 to 4 hours return. 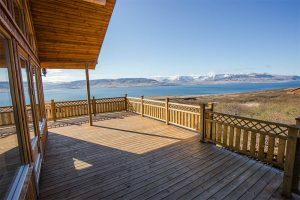 Head to the Golden Circle by driving around the bay Hvalfjordur and take the Rd 48 to Thingvellir, then on to Geysir and Gullfoss and the same way back. 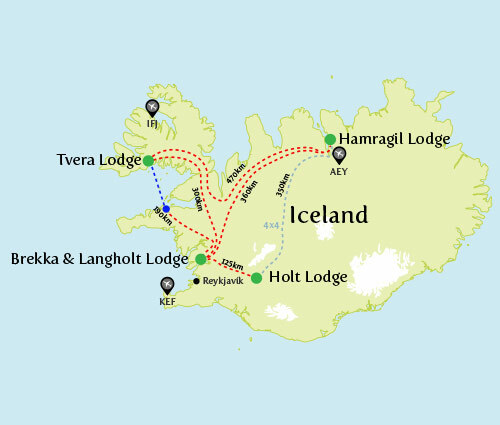 Alternatively take the tunnel in the direction of Reykjavik and then Rd 36 to Thingvellir. 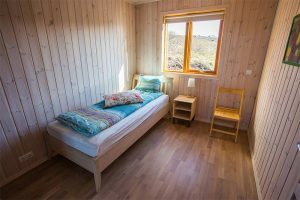 As a part of the circle during summer, and driving a 4x4 vehicle, you can reach Gullfoss ‘from behind’ by turning left on to Rd. 47, left again to Rd. 50 and right on to Rd. 52. Proceed and go on the scenic trail F338 south of the glacier Langjokull. The Gold Circle tour could take up to 8 - 9 hours. 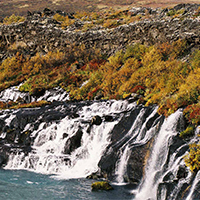 You can reach the waterfalls Hraunfossar and Barnafoss by driving left onto Rd 47 and then left again onto Rd 53 which merges into Rd 518 (alternatively you take Rd 47 to your right, which merges into Rd 1, then off to your right before the town of Borgarnes onto Rd 518. It takes up to 1.5 hours to get there. Deildartunguhver, the biggest hot spring in Europe yielding almost 200 liters of boiling water in a second, is to your left when driving on the Rd 518, before you reach Reykholt. 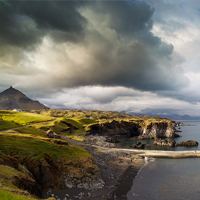 By driving through the town Borgarnes, take the Rd 54 to your left and you can see the peninsula Snæfellsnes and its spectacular views. 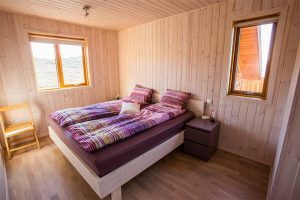 It will take you a whole day to make this rewarding tour. 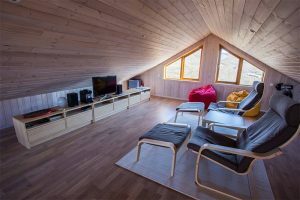 Still the Settlement Center in Borgarnes, with the two exhibitions on the first decades of the Icelandic history (www.landnam.is), is really to be recommended. 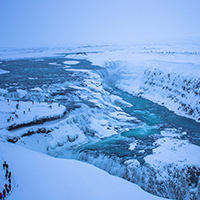 More information on http://www.infoiceland.is, and www.weather.is for weather forecast and www.road.is for road conditions in winter. 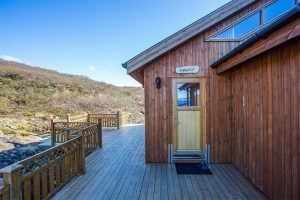 Langholt Lodge - Book now! 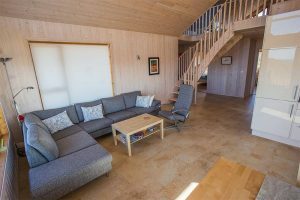 The spacious lodge Tvera is situated in the secluded pristine environment of the widely untouched south coast of Iceland’s Westfjord. 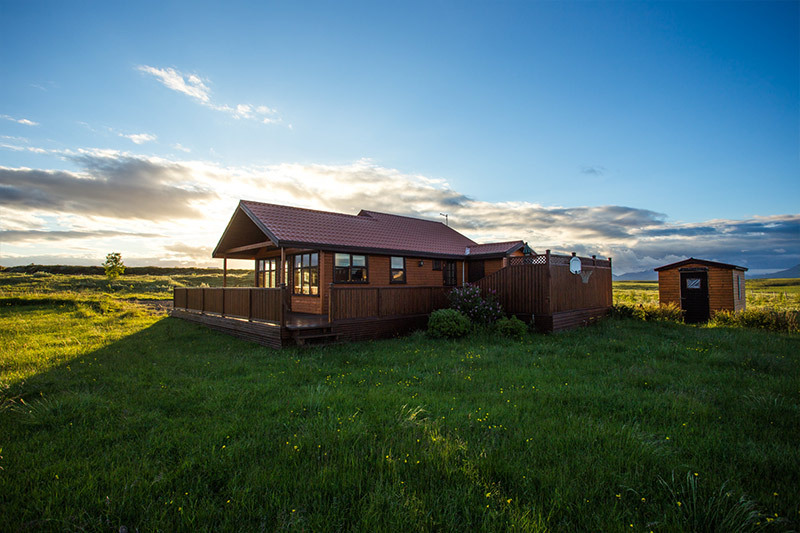 Experience the solitude of Hamragil, a beautiful spacious lodge in the centre of the north of Iceland. In the center of the most famous sights of Iceland. 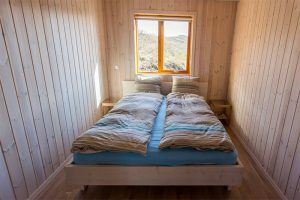 Only 1h and 15‘ from Reykjavik. 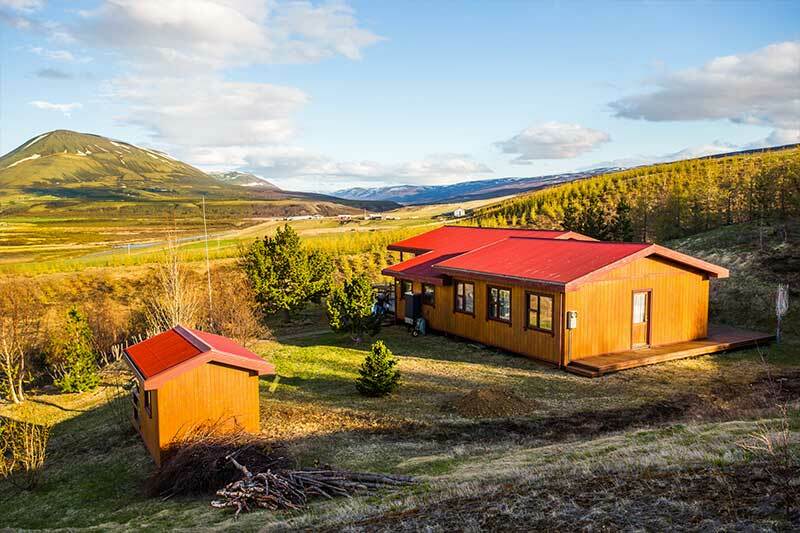 Midst in the Southern lowlands with an easy access to some of the most impressive sights of Icelandic nature. 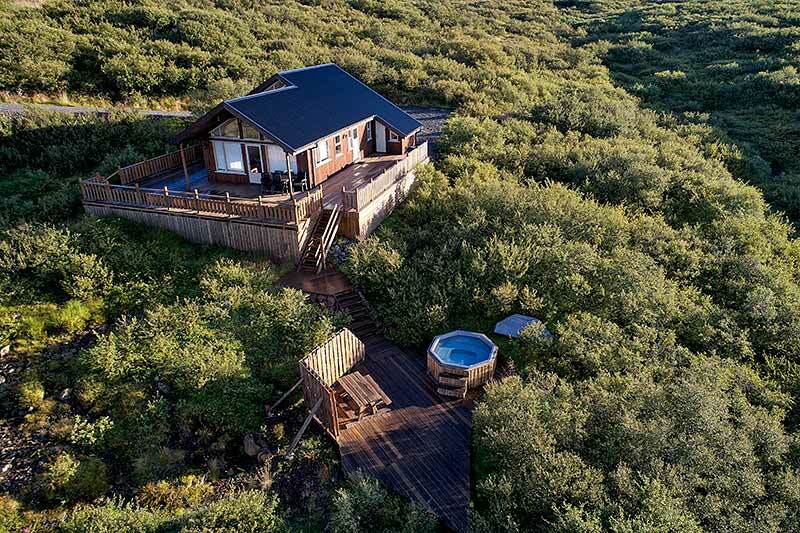 This beautiful lodge is situated on the perfect slope overlooking the Atlantic Ocean and surrounding Sulur mountain ranges and is only 45 minutes from Reykjavik.